It's Saturday morning! COMICS TIME. I'm still very very slowly—I'm trying to space them out because once I'm caught up, the month-to-month wait will be ENDDDDLESSSSSS—getting all caught up on Giant Days. These panels are from Giant Days #21, in which our heroines' apartment is burgled and they go to a seedy bar—in disguise and relying on Susan's "street smarts"—in an attempt to get their stuff back. If you're at all familiar with Susan, Daisy, and Esther, you will not be surprised to hear that it doesn't go particularly well. 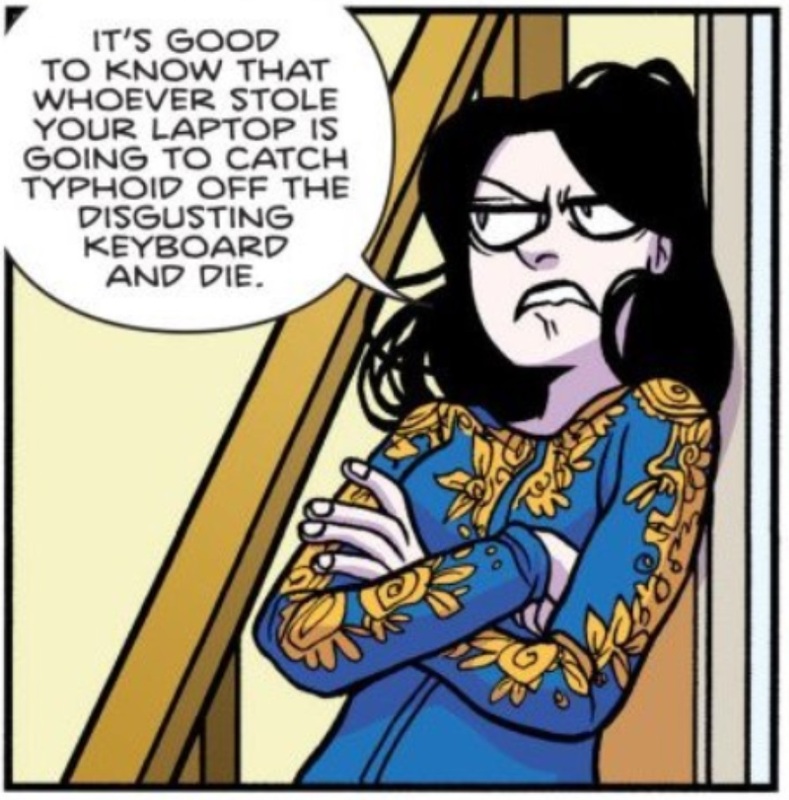 Panel from Giant Days #21. Esther: Oh, wow. Your room's even worse than mine and Daisy's. Susan: Oh? Oh, no, it was already like this. I'm not a good person. Esther: It's good to know that whoever stole your laptop is going to catch typhoid off the disgusting keyboard and die. • McGraw fixes a door! • Susan makes Daisy and Esther watch Roadhouse! • WE FIND OUT THAT DAISY IS BASICALLY NEVILLE LONGBOTTOM AND OMG IT MADE ME CRY. 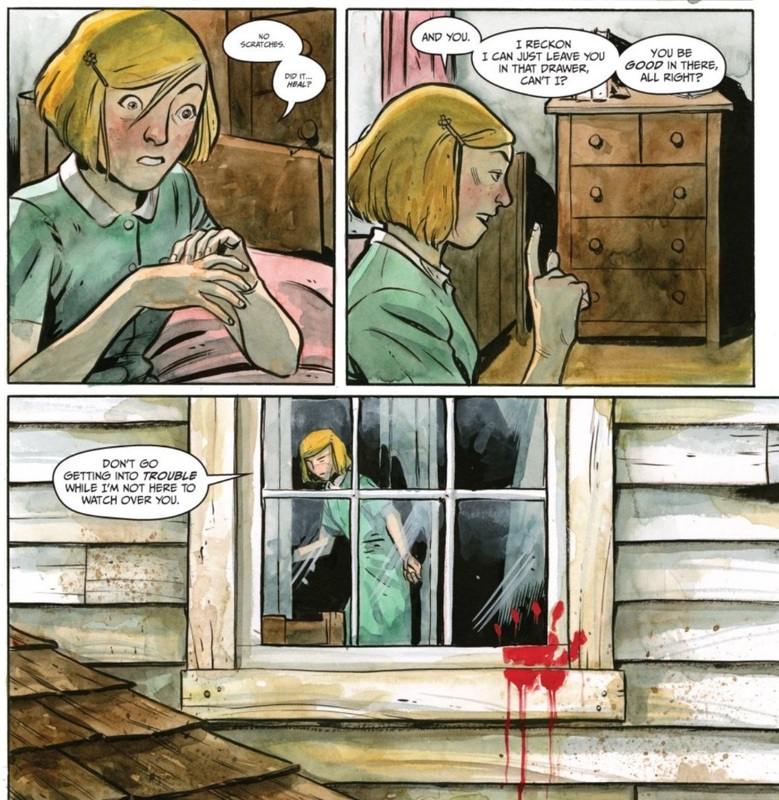 I also just started Harrow County, which is a Southern Gothic, YAYYYYYYY! And it is CREEPY AS ALL GET-OUT. Also: YAAAAYYYYYYYYYYY! Emmy: No scratches. Did it... heal? Emmy: And you. I reckon I can just leave you in that drawer, can't I? You be good in there, all right? Emmy: Don't go getting into trouble while I'm not here to watch over you. Shortly thereafter, she realizes that pretty much everyone she knows—INCLUDING HER OWN FATHER—means to do her harm, so she goes on the run. And, as I said, I've only read through Issue #2. But there's more! AFTER the story installment, the author includes a brief family ghost story, a call for MORE ghost stories from readers, and another short horror comic. So that should make for good fun in later issues.